The scientific name for the Gray Wolf is Canis Lupus. 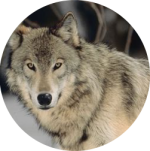 Gray Wolves are also known as Timber Wolves, Tundra Wolves, Plains Wolves, Arctic Wolves, Buffalo Wolves, Lobo Wolves and Mexican Wolves. Gray wolves have a thick bulky coat that consists of layers that insulates and protects the wolf. The Gray wolves coat is usually gray but it can vary from nearly white to red, brown, black or even a combination of colors. Gray wolves have a strong stocky build, excellent hearing and strong sense of smell. An adult male gray wolf weighs 32-68 kg the length of a male gray wolf from the tip of their nose to the tip of their tail is 4.5-6.5 feet. Female gray wolves typically weigh approximately 20% less than their male counterparts. Gray wolves have a highly developed social order. Gray wolves are found in packs of typically 8 wolves. Though a pack can be as small as 2 wolves or as large as 20 wolves. Though packs with as many as 40 wolves have been reported. The pack is ruled by a complex social order, typically it contains a breeding pair of wolves and subordinate wolves which are often offspring of the breeding pair. The breed pair is also known as the �alpha� pair. They younger pack member will constantly try to improve their standing in the pack. If the superior male wolf shows weakness through disease or age, they younger wolves will assert themselves for the leadership position. The alpha pair of wolves is usually the only pair in the pack to breed. They will usually attempt to prevent other pack members from mating by using aggressive behavior. The breeding pair usually mates for life. Gray wolves communicate with each other by howling, body language and scent. The wolf howl we know so well, is used to assemble a pack and assert territorial control over a packs domain. A wolf�s howl can beard up to 6 miles away. Gray wolves can reach speeds of up to 40 mph, though their typical traveling speed is closer to 5 mph. Gray wolves are carnivores they prey on deer, elk, moose and smaller animals native to their habitat. Gray wolf gestation is about 2 months with most gray wolf pups being born in March -June. The female Gray Wolf will give birth in a den, they try to locate the den near a water source. The den is only used to rear young. Gray wolves have 2-11 pups in a litter. The Gray wolf pups are born deaf and blind and only weigh about a poind. They Gray wolf pups are completely dependant on their mother for the first two months. A well fed wolf pup is strong enough to travel with the pack by 3-5 months, and juveniles may leave the pack at a year ol. The rest of the pack assists in raising and guarding the wolf pups. The pack members will even assist in feeding the litter of pups and the Mom by sharing their kills. Gray wolves are fierce hunters. Working in hunting groups wolves can bring down large animal like musk ox. Gray Wolves will follow herds as they migrate. Gray wolves live from 8-16 years in the wild, though they have lived for over 20 years in captivity.